Every day, our liver is forced to process huge amounts of toxins that come to us with food additives, pesticides, alcohol and so on. Today we are talking about TOP 8 foods will help liver from toxins. Most toxins are fat-soluble, that is readily absorbed by fatty tissue and stored there. The work of the liver is to convert toxins into water-soluble form — because of this they are excreted in urine, stool and sweat. Detoxification occurs in two phases. In the first phase, the toxins are broken into small pieces with enzymes during chemical reactions. In the second phase bind, the substance obtained in a fully water-soluble form so that they can be eliminated. In some cases, exposure to toxins is beyond our control. However, we can support the liver by balancing both phases of detoxification and protect it from toxic overload. On the work of the liver is affected by many factors, including our diet. And strengthen the liver to help these foods. Cabbage, broccoli, Brussels sprouts and other cruciferous not only rich in vitamin B but also contains important phytonutrients, including sulforaphane — a sulfur compound that increases the efficiency of liver detoxification at both stages. The peel of oranges, lemons and tangerines contain antioxidant D-limonene, which is known for a strong stimulating effect on liver enzymes in both phases of detoxification. Two glasses of drinking water with the juice of one lemon in the morning on an empty stomach will bring a lot of benefits to your liver. Garlic contains a sulfur compound called alliin, which is converted to an active and healthy for the liver ingredient allicin when we grind, cut or crush garlic. Allicin is a powerful antioxidant, which prevents the penetration of toxic substances processed by the liver to other organs. Garlic also contains selenium — a mineral that enhances the effect of antioxidants. Add 1-2 cloves of garlic to your favorite dishes every day. Protein is essential for growth, repair and detoxification of cells. For efficient detoxifying liver, especially during the second phase, the body must have the correct amino acid. The most important of them — cysteine, methionine, taurine, glutamine, and glycine. Good sources of these amino acids are nuts, seeds, legumes, eggs, fish. Fresh fruits and vegetables in the diet should be present in abundance because they are responsible for the intake of important antioxidants. 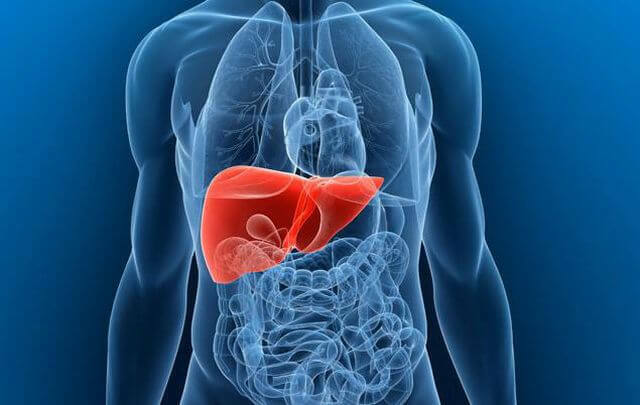 Bioflavonoids and anthocyanins (purple pigment in plant foods), chlorophyll (green pigment), carotenoids (yellow and orange pigments) are powerful protectors of the liver. Try to eat 5 fruits and vegetables of different colors every day to get the full range of health benefits. In modern herbal medicine milk thistle, it is one of the key plants to maintain liver function. Its active ingredients belong to the group of bioflavonoids with general name silymarin. Studies show that they protect against liver disease. Silymarin liver activates the production of glutathione, which is one of the key agents in detoxification. Furthermore, thistle enhances the ability of liver cells to regenerate. Curcumin present in turmeric enhances detoxification enzymes in the second stage, which increases the secretion of bile. It helps break down toxins and digest fats. Turmeric also exhibits a strong antioxidant activity against a number of toxic chemicals and liver preparations. Just one teaspoon of turmeric powder in a day provides all of these effects. Here is the recipe, «tea» from turmeric. Green tea has powerful antioxidant properties and protects the liver. Bioflavonoids in green tea enhance liver detoxification at both stages.